Applying optical switching to data center networks can greatly expand network bandwidth and reduce electrical power consumption, both of which are needed to meet the explosive traffic increase. The optical switch offers large bandwidth switching capability, and so eliminates the multistage switch network architecture needed with electrical switching. Furthermore, the single stage architecture of the optical switch greatly simplifies operating costs, which include cabling, while substantially reducing the number of transponders needed. Data center networks place very different demands on optical systems than communication networks. Grasping the right direction to proceed is of paramount importance. To realize the full potential of optical switches, such as scalability and cost effectiveness, we analyze the role of large-scale optical circuit switches and discuss the realization technologies that combine the two dimensions of space and wavelength. Our recent advances in large port-count optical switches are presented. Cisco Global Cloud Index: Forecast and Methodology, 2011–2016. OIDA Workshop report, Future needs of scale-out data centers, 2013. R. Courtland, “Transistors could stop shrinking in 2021,” IEEE Spectrum, vol. 53, no. 9, pp. 9–11, 2016. N. Farringtonet al., “Helios: A hybrid electrical/optical switch architecture for modular data centers,” in Proc. ACM SIGCOMM, 2010, pp. 339–350. G. Wanget al., “C-Through: Part-time optics in data centers,” in Proc. ACM SIGCOMM, New Delhi, India, 2010, pp. 327–338. N. Farringtonet al., “A 10 μs hybrid optical-circuit/electrical-packet network for datacenters,” in Proc. 2013 Opt. Fiber Commun. Conf. Expo. Nat. Fiber Opt. Eng. Conf, Anaheim, 2013, OW3H.3. Y.-K. Yeo, Q. Huang, L. Zhou, “Large port-count optical cross-connects for data centers,” in Proc. Photon. Switch., Corsica, France, 11–14, 2012. P. N. Jiet al., “Design and Evaluation of a Flexible-Bandwidth OFDM-Based Intra-Data Center Interconnect,” IEEE J. Sel. Topics Quant. Electron., vol. 19, no. 2, 2013, Art. no. .
Z. Caoet al., “Hi-LION: Hierarchical large-scale interconnection optical network with AWGRs [invited],” IEEE/OSA J. Opt. Commun. Netw., vol. 7, no. 1, pp. A97–A105, 2015. S. Spadaro, “Control plane architectures for photonic packet/circuit switching-based large scale data centres”, in Proc. ECOC 2013 Symp., London, U.K., 24, 2013. J. Perellóet al., “All-optical packet/circuit switching-based data center network for enhanced scalability, latency, and throughput,” IEEE Netw., vol. 27,no. 6, pp. 14–22, 2013. R. Shioya, “Research trends of processor architecture,” The Institute of Electronics, Information and Communication Engineers (IEICE), General Conference, SS-7, Kusatus, Japan, 10–13, 2015. M. Takamiya, H. Shinohara, and T. Sakurai, “Low energy LSI with extremely low voltage operation,” J. IEICE, vol. 93, no. 11, p. 943, 2010 (in Japanese). International Technology Roadmap For Semiconductors 2013 Edition. A. Singhet al., “Jupiter Rising: A decade of clos topologies and centralized control in google's datacenter network,” in Proc. SIGCOMM 15, London, U.K., 17–21, 2015, pp. 183–197. M. Nowell, “50 Gb/s ethernet over a single lane and next generation 100 Gb/s & 200 Gb/s ethernet call for interest consensus presentation,” IEEE 802.3, 10, 2015. A. Ghiasi, “Large data centers interconnect bottlenecks,” Opt. Exp., vol. 23, pp. 2085–2090, 2015. N. Farrington and A. Andreyev, “Facebook's Data Center Network Architecture,” in Proc. IEEE Opt. Interconnects Conf., 2013, pp. 49–50. D. A. Maltz, “Scaling bottlenecks in data center networks,” in Proc. OFC 2014, San Francisco, CA, USA, 9-13, 2014, Paper Tu2I.1. H. Dorrenet al., “Challenges for optically enabled high-radix switches for data center networks,” IEEE J. Lightw. Technol., vol. 33, no. 5, pp. 1117–1125, 2015. R. Blum, “Scaling the compute and high speed networking needs of the data center with silicon photonics,” presented at the ECOC 2017 Market Focus, Datacenters: Optics in Cloud Computing, session 1, Gothenburg, Sweden, Sep. 19, 2017.
International Technology Roadmap For Semiconductors 2.0, 2015 Edition. R. S. Tucker, “Green optical communications—Part II: Energy limitations in networks,” IEEE J. Sel. Topics Quantum Electron., vol. 17, no. 2, pp. 261–274, 2011. K. Sato and H. Hasegawa, “Optical networking technologies that will create future bandwidth-abundant networks [invited],” J. Opt. Commun. Netw., vol. 1, no. 2, pp. A81–A93, 2009. K. Sato, “Realization and application of large-scale fast optical circuit switch for data center networking,” in Proc. ECOC 2017, 17–21, 2017, Paper Tu2F.1. A. Greenberget al., “VL2: A scalable and flexible data center network,” in Proc. SIGCOMM, Barcelona, Spain, 2009, pp. 51–62. L. Kleinrock, Queueing Theory.1st ed.Hoboken, NJ, USA: Wiley, 2, 1975. L. A. Barrosoet al., The Datacenter As a Computer, An Introduction to the Design of Warehouse-Scale Machines.2nd ed.San Rafael, CA, USA: Morgan & Claypool, 2013. A. Vahdat, “Delivering Scale Out Data Center Network- ing with Optics — Why and How,” in Proc. Opt. Fiber Commun. Conf. Expo., 2012 Nat. Fiber Opt. Eng. Conf., San Diego, CA, USA, 2012, Paper OTu1B.1. M. C. Wuet al., “MEMS-enabled scalable silicon photonic switches,” in Proc. Front. Opt./Laser Sci., San Jose, CA, USA, 2015, Paper FW3B.2. K. Tanizawaet al., “32 × 32 strictly non-blocking Si-wire optical switch on ultra-small die of 11 × 25 mm2,” in Proc. Opt. Fiber Commun., Los Angeles, CA, USA, 2015, Paper M2B–5. 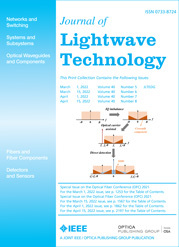 T. Niwaet al., “Large port count wavelength routing optical switch that consists of cascaded small-size cyclic arrayed waveguide gratings,” IEEE Photon. Technol. Lett., vol. 24, no. 22, pp. 2027–2030, 2012. K. Satoet al., “A large-scale wavelength routing optical switch for data center networks," IEEE Commun. Mag., vol. 51, no. 9, pp. 46–52, 2013. K. Uedaet al., “Fast optical circuit switch for intra-datacenter networking,” IEICE Trans. Commun., vol. e100–b, no. 10, pp. 1740–1746, 2017. K. Uedaet al., “Large-scale optical circuit switch for intra-datacenter networking using silicon-photonic multicast switch and tunable filter,” in Proc. 42nd Eur. Conf. Opt. Commun., Dusseldorf, Germany, 2016, Paper W.2.F.2. K. Ishii, H. Hasegawa, and K. i. Sato, “Formulation of MUX/DEMUX functions for multiple input-output port cyclic AWG,” in Proc. 2012 Asia Commun. Photon. Conf., Guangzhou, China, 2012, Paper AS4A.3. K. Sato, Advances in Transport Network Technologies.Norwood, MA, USA: Artech House, 1996. K. Xi, “A petabit bufferless optical switch for data center networks,” in Optical Interconnects For Future Data Center Networks, New York, NY, USA: Springer-Verlag, 2012, vol. 3, pp. 135–154. K. Uedaet al., “Demonstration of 1,440 × 1,440 fast optical circuit switch for datacenter networking,” in Proc. 21st OptoElectron. Commun. Conf./ 2016 Int. Conf. Photon. Switch., Niigata, Japan, 3–7, 2016, Paper WF1-3. S. Nakamura, S. Yanagimachi, H. Takeshita, A. Tajima, T. Hino, and K. Fukuchi, “Optical Switches Based on Silicon Photonics for ROADM Application,” IEEE J. Sel. Topics Quantum Electron., vol. 22, no. 6, pp. 185–193, 2016, Art. no. .
H. Matsuuraet al., “Accelerating switching speed of thermo-optic MZI silicon-photonic switches with “Turbo Pulse” in PWM Control,” in Proc. Opt. Fiber Commun. Conf., Los Angeles, CA, USA, 2017, Paper W4E.3. S7500 Product Specification, CW Tunable Laser, Finisar. K. Uedaet al., “Large-scale optical switch utilizing multistage cyclic arrayed-waveguide gratings for intra-datacenter interconnection,” IEEE Photon. J., vol. 9, no. 1, 2017, Art. no. .
K. Okamoto, T. Hasegawa, O. Ishida, A. Himeno, and Y. Ohmori, “32 × 32 arrayed-waveguide grating multiplexer with uniform loss and cyclic frequency characteristics,” Electron. Lett., vol. 33, no. 22, pp. 1865–1866, 1997. H. Nagai, Y. Mori, H. Hasegawa, and K. Sato, “Demonstration of 153.6-Tbps throughput from 1,536 × 1,536 optical switch with uniform-loss and cyclic-frequency AWGs,” in Proc. SPIE, 2018, Paper 105600.